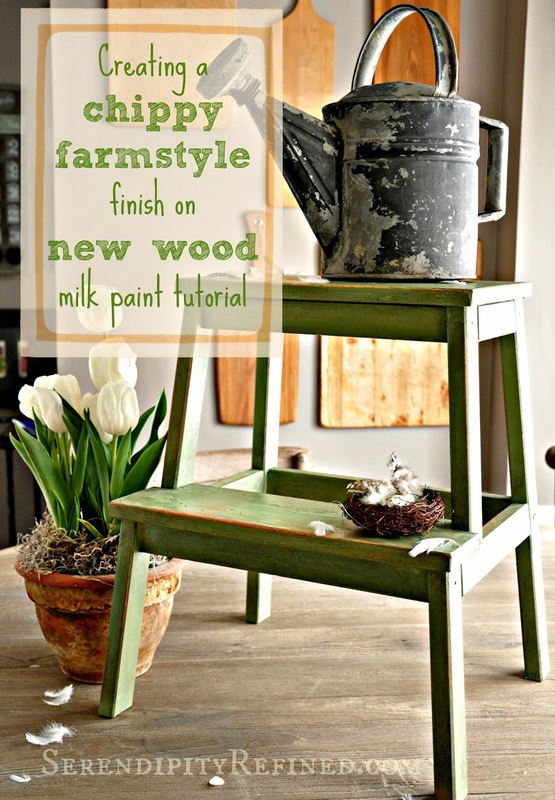 Today, I'm going to show you how to achieve that rustic, chippy, farmhouse style finish that milk paint is famous for. I'm creating an aged finish on brand new wood using another Ikea step stool. It's the same one that I used in the post about using milk paint on new wood without bonding agent that I wrote a couple of weeks ago. The finish that I'm creating today is completely different. On this piece, I don't want the finish to be even and smooth because I plan to use it as a gardening stool. It'll be in my mudroom most of the time and I want the paint to peel, and flake, and chip off. I want this step stool to look as if it has a story to tell. My goal is to make it appear to have the type of history that well loved, time washed, pieces convey. While I love having older pieces in my home but I don't always have the luxury of having inherited them or being able to find the perfect piece when I need it. Sometimes, I simply have to create the look and today, I'm showing you how to do just that! The very first thing that I did was to give the piece a little character. I thought about the areas that would typically show wear: the top, the front of the step and the hand hold. I considered the times that I've used my small ladder as a work bench and accidentally drilled through a piece into the top of it or missed the edge of something that I was hammering and dented the top step. Basically, I hurried along what would inevitably happen to this step stool if it stayed in my possession long enough. I filed the edges of the front of the step and the top with a wood file. I hit it with a hammer, I made a few nail holes. Use whatever you'd like to remove the "brand new" appearance by creating a few nicks, dings and scratches. 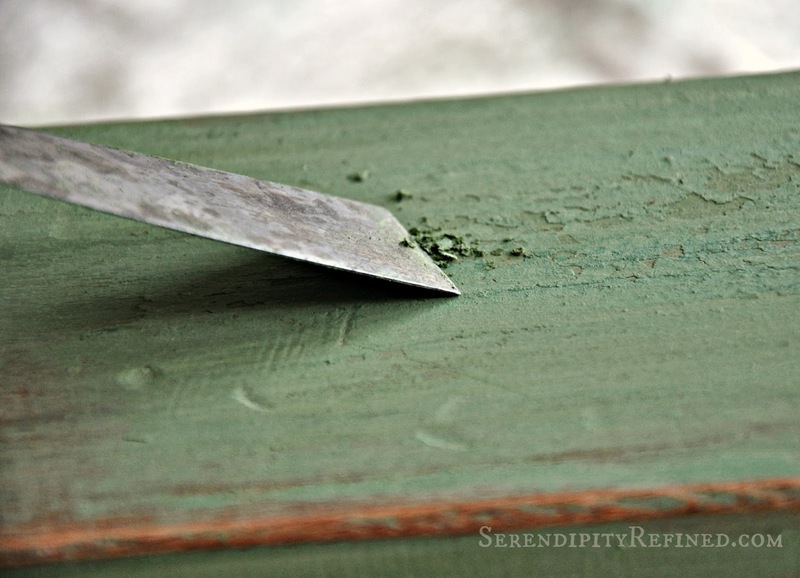 Next, I liberally apply hemp oil to the surfaces where I want the paint to flake and peel. Note: The appearance of peeling paint can also be achieved by coating some areas with Vaseline or rubbing solid beeswax onto some areas and painting over it. 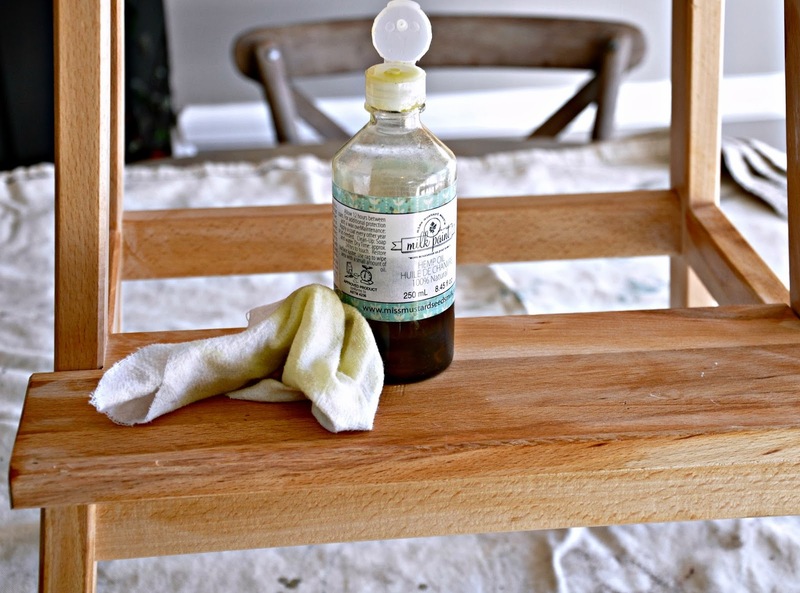 The wax and oil cause the paint to resist adhering to the areas that are coated and enable the paint to be wiped off to expose the wood (or prior color) underneath. As with any new finish, always test your finish on a spare piece of wood or the bottom of the piece to see how it looks before applying it to the entire piece. I applied the first coat of paint (Luckett's green) mixed 1 part paint to 2 parts water (Note: ALWAYS put the water in first, and then add the paint..no matter what the directions say...You're welcome!) while the oil was still on the surface of the piece. After a couple of minutes, I lightly brushed the paint with a dry paintbrush while the paint was still wet. This caused the paint to peel off and move around in some areas making a finish that is thicker in some areas and more uneven. Part of making an "aged" piece believable is knowing what would likely happen to the piece over time; the paint would fade, part of it would likely have been chipped off and it would have been repainted; either with a shade of paint that was not quite the same as the original or, in some cases, a completely different color. I chose to make the "new" color almost the same as the "original" color. 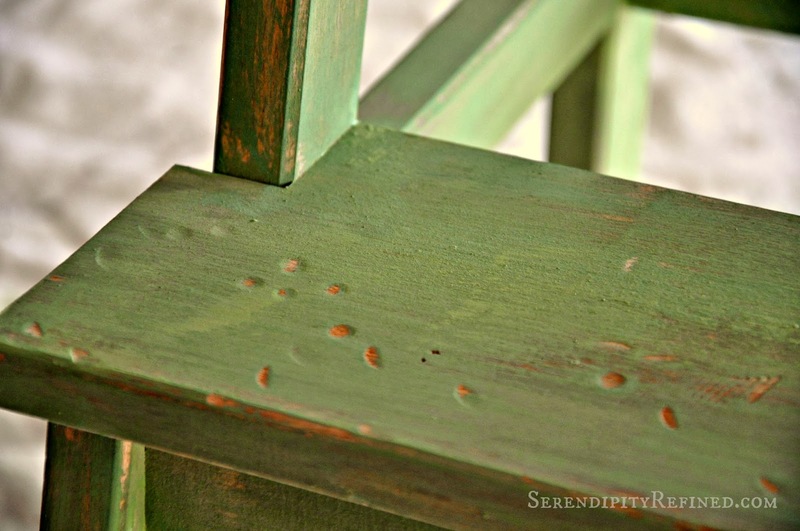 To achieve this look, after the first coat of paint dried, I applied more oil in some areas. 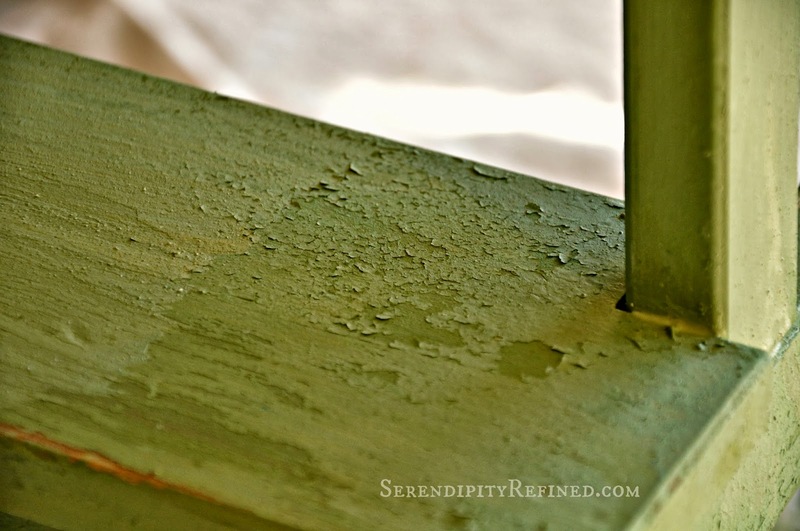 Then, I mixed one teaspoon of Shutter Gray paint powder with 2 tablespoons of Luckett's Green and 1/4 to 1/2 cup of warm water and brushed it on almost the entire piece using random strokes and not worrying about complete coverage because part of the paint will chip and peel off anyway. Imperfection is perfect for this finish. After that, I waited...and watched as the flaking happened. Have you ever heard the old saying, "It's about as exciting as watching paint dry"? Clearly, these people never watched milk paint as it dries and begins to peel! I allowed the paint to cure for three days then went over the entire piece very lightly with a putty knife to remove the loose flakes. The last step before waxing was to lightly sand only the edges of the front of the step, the top and hand hold because those would be the areas that I would expect would show the most wear if this were an old piece. Finally, I applied the wax. A Note about wax: I have a variety of waxes in my tool kit which I use for creating different types of faux finishes on wood pieces. I've tried them all and I really have no preference so long as 1) the wax is soft while I'm working with it and 2) it dries to a hard finish. 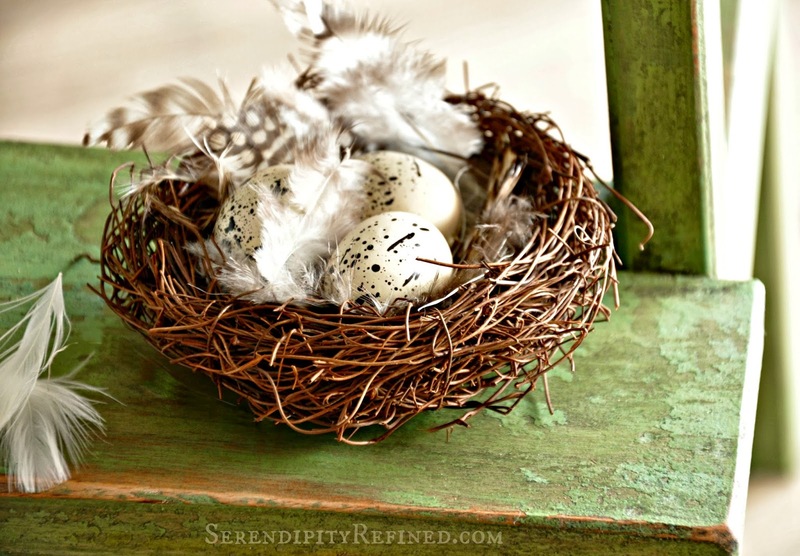 I often mix clear wax with chalk paint or colored pigment powder to create tinted waxes in special colors. I've even used black or white shoe polish mixed with wax to achieve a desired look before new lime and antiquing waxes were introduced. There is more than one way to get the look. Again, try it on the bottom of the piece where it won't show before applying it. When creating the finish on this piece, I used MMS antiquing wax (sparingly...the stuff is like gold) paying careful attention to the corners, the rails and the other parts of the piece where the grime of time would have settled on the piece and not been worn or wiped away. 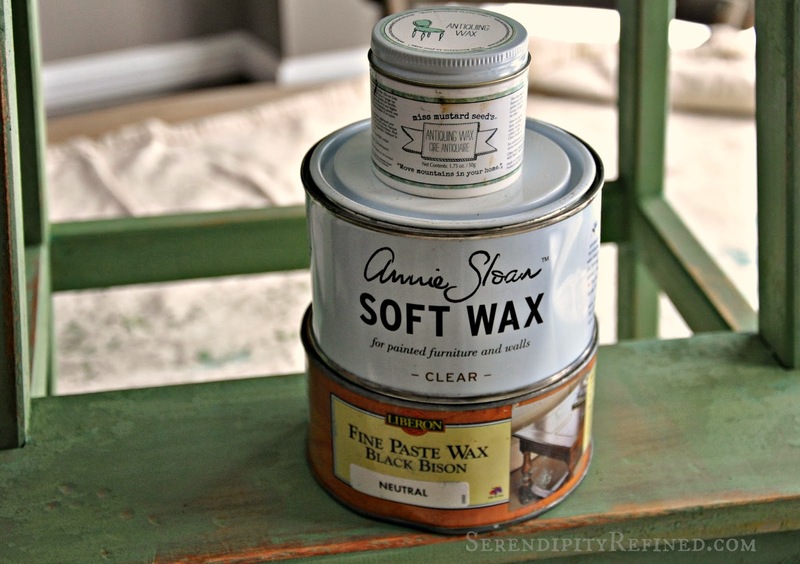 First, I swirled a brush (I use Annie Sloan wax brushes because I've had them for years) in MMS antiquing wax and applied it, in a circular motion, working the wax into the paint. After about 10 minutes, I blended the antiquing wax with clear Annie Sloan wax on the areas where the "dirt" would have been worn away. I also used the clear Liberon wax on the undersides of the piece because I didn't want to waste expensive antiquing wax on areas that no one will see. I'm really pleased with the way that my new garden bench turned out. 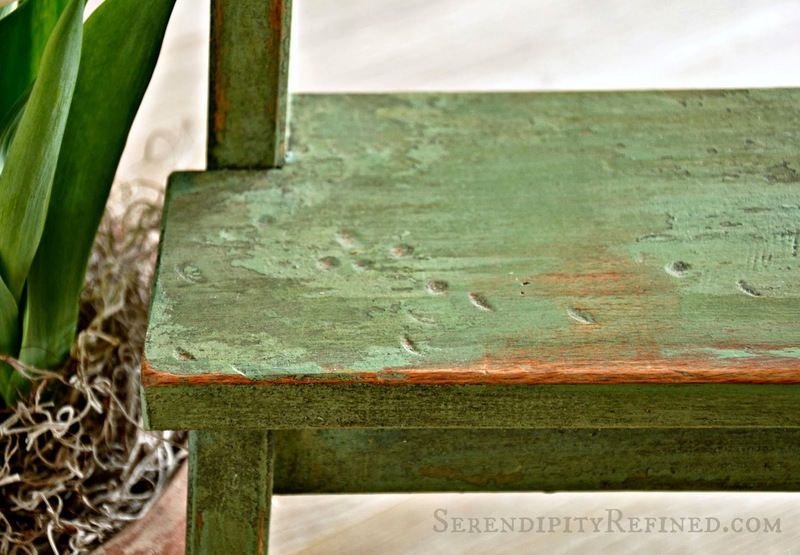 It's the perfect amount of crusty, chippy and worn and it makes a nice addition to the mudroom. 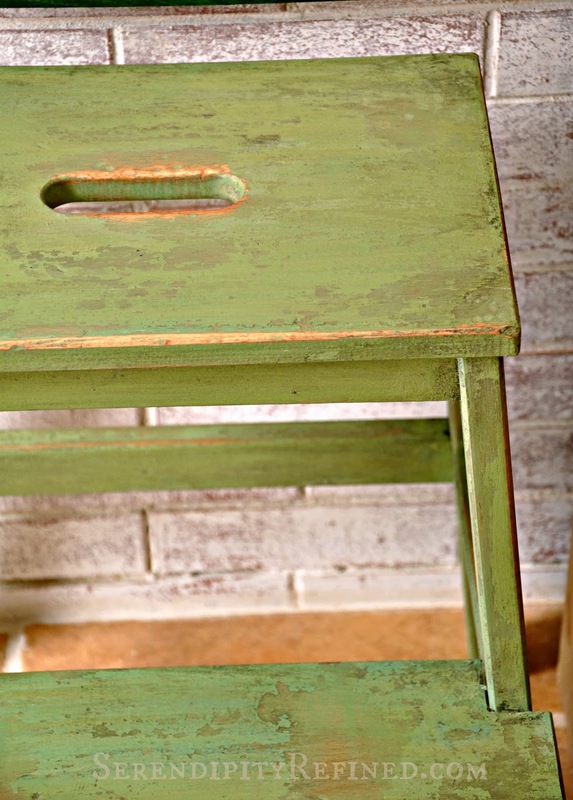 I'm sure that this little step stool will develop even more character and have many stories to tell but until then, it looks like it has already been well loved. I hope that I've inspired you to create your own chippy, rustic, milk painted finish on new wood. There's really no wrong way to do it. 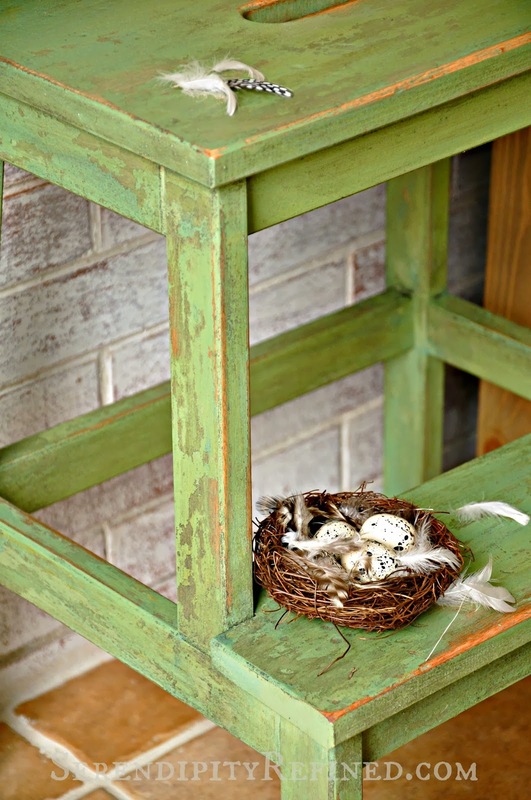 Using milk paint with oil and layering colors an easy way to add a sense of history and character to brand new pieces for your home.